I was excited to jump back into the Oracle series with Ret and his friends. These books just appeal to my Science side and I am amazed at how C.W. Trisef can make the unreal make sense. I was awed by it in the first book and wasn’t let down in this book either. This book picks up where the last book leaves off and rather than just jumping onto the next thing, it does a good job of wrapping up the last adventure. It’s not one of those instances where you wonder how nobody noticed this World altering event took place. I love Ret as the main character but he is still got some growing up to do. I like though how active the adults are in guiding him. They give him insight that he needs to kind of figure things out. He is definitely still finding himself out and to me it makes him endearing. He’s not perfect he has flaws and that is something that I’m greatly fond of in characters. I also like the slow blooming romance with Paige. What I really liked about this book was that the characters broke off into groups and kind of had their own separate stories. It wasn’t all of them together all the time and it was nice to have that. It gives some of the characters the ability to shine a little more on their own. I have to admit I have a strange fondness for Ben Coy, he can be a really arrogant jerk but there is just something about him that gives you the impression that he is really looking out for the kids. It might also be because I want to live in his house! I love the planetarium! I found Pauline to be less annoying in this book. I remember her kind of driving me nuts sometimes in the first book. Paige holds steady as likable character for me and same with Ana. Argh the cliffhanger, there were two parts to this one. It was one of those where I flipped a couple pages after the last one thinking, hold on you are going to leave it hanging like that. Well it did and now of course I have to read the next book. It’s a series that I’m going to keep reading because the books have kept me engaged completely through both of them. I’ve never felt like I’m shocked that there is going to be seven books. I have really enjoyed the first two. I’m also starting to be convinced that C.W. 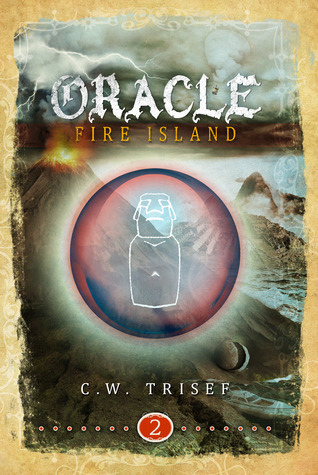 Trisef is floating around in an invisible hot air balloon…. This series sounds awesome! I can't wait to start reading. I just checked out the website and am really intrigued. Thanks for your great review! So glad you are enjoying this series..and GRRR the dreaded cliff-hanger!! clever work and coverage! Keep up the awesome works guys I've included you guys to our blogroll.